There are many ways in which people and dogs are similar, but an area in which dogs are much superior is in their olfactory ability, or their sense of smell. Dogs can smell 100,000 times better than humans. In tests, dogs have been able to detect a chemical in a solution diluted to 1 to 2 parts per trillion. The human brain has a large area devoted to vision, while dogs have a large portion dedicated to olfaction, in fact, 40% more of a dog's brain than a human's is committed to smell. The average person has 5 million smell receptors, while the average dog, depending on breed, has 125 to 250 million smell receptors. The Bloodhound has an incredible 300 million smell receptors! Dogs can smell things up to 40 feet underground. Dogs can even smell human fingerprints that are a week old! Part of the reason dogs have an excellent sense of smell is the moist leathery surface of the nose determines the direction of air currents. 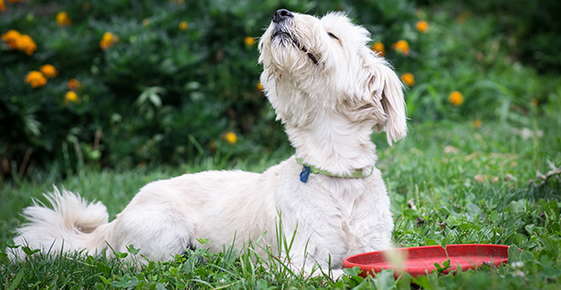 Also sniffing brings air with scents directly into the nostrils and then onto the moist surfaces inside the nasal cavity which catches the molecules so the dog's internal receptors can decode them. It is believed that even long ear flaps can help their sense of smell by stirring up odors close to the ground. People have taken advantage of this incredible sense of smell and trained dogs to detect certain odors. One of the more unusual objects that dogs have been trained to find is whale feces. Whale researchers for years have been stymied by their inability to test whales in the wild. It was then discovered that whale poop could give them information on diet, genetics, hormone status, level of toxins, etc. But how to find enough whale feces to get significant findings? Whale feces floats for only about 30 minutes. One research group found only five samples in two weeks by searching on their own. Then Tucker and Fargo came into their lives. Tucker is a Labrador mix -breed dog who searches for Orca whale feces in Puget Sound, and Fargo is a Rottweiler who finds right whale poop in the North Atlantic. With the dogs on board, the research teams have found as many as 12 samples a day. At first their success rate was less, only because the researchers underestimated the distance at which the dog could detect the odor. With time the researchers learned that when the dog signaled , they should point the boat in the direction of the dog's nose and keep going until they found the feces; this has been as far as 1.2 miles. As one researcher said," The lowest-tech method turns out to be the most effective." Findings from these studies show that the orcas have had a drop in thyroid hormone; the researchers attribute this to a poor food supply. This could explain why orcas had a 20% decline in population in the last decade in Puget Sound. The Atlantic study has not found the reason for the poor reproduction of the right whale since a hunting ban went into effect 70 years ago. From a low of 100 whales, the population is now only about 300, while 100,000 used to swim those waters. Research continues as long as the dogs keep finding samples! Another amazing example of dogs detecting unusual things is the study that showed that dogs can identify people with cancer by smelling the person's breath or urine. The person's breath was used to find lung and breast cancer; urine was used to detect bladder or prostate cancer. The dogs were accurate 99% of the time for lung cancer, and 88% of the time for breast cancer! This is equal or better than high tech techniques such as scans. This study was done with only two to three weeks training using pet dogs and the only previous preparation was basic puppy training. For centuries dogs have helped people with hunting, herding, and protection. These examples clearly show that dogs are capable of much more. Only our imaginations may limit what dogs might do in the future. "Dr. Strolle is the nicest vet I have ever used. 100% recommend this team." "Thorough and gentle! It’s such a tough thing to deal with when our pets are hurting. The staff and Dr were phenomenal! Hope to not be back soon but I know Noki will be taken care of with love if needed." "I just moved to the area three months ago with a 16-year-old dog. We’ve been to Best Friends more than I’d like, but so grateful to have such informed, compassionate Veterinarians to work with. The front desk and Vet Techs are also terrific!"